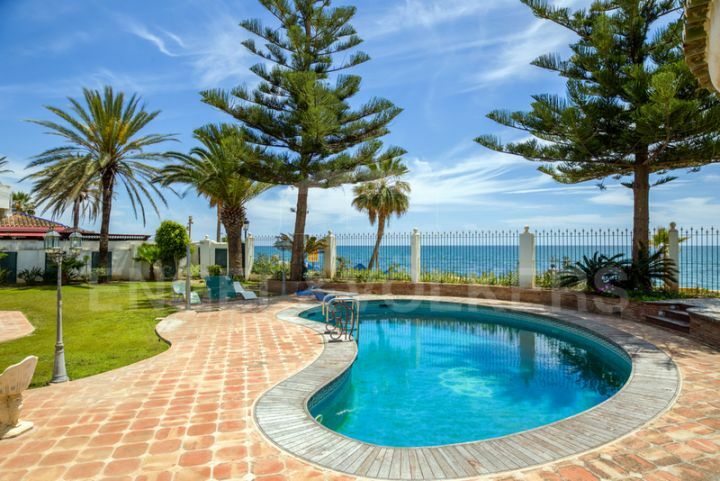 The soothing sound of waves lapping gently on the shore, the fine golden sands and uninterrupted views across the Mediterranean Sea to the mountains of Morocco; it is easy to see why beachfront property in Marbella is always in great demand. From private and secluded villas set in extensive grounds and featuring infinity-edge pools and tropical gardens, to luxury apartments and penthouses with every conceivable amenity, Marbella has a selection of the finest frontline beach properties for sale along its 27 kilometres of coastline. The most exclusive area is Marbella’s Golden Mile, particularly around the Marbella Club and Puente Romano resorts. Here villas of palatial proportions set in large landscaped grounds with uninterrupted sea views and direct access to the seafront promenade can be found. A little further west, Puerto Banús features luxury beachside apartments, villas and penthouses, while to the east Los Monteros, Río Real, Elviria and Las Chapas offer some of the best sandy beaches in Marbella in a secluded and natural setting. Our offices are located in the most prestigious and sought after areas of Marbella, and all have a wide selection of top quality beachside properties available for sale.